Construction work on the Chinese funded Rs.2,430 million National Performing Arts Theatre commenced on Friday in Colombo. 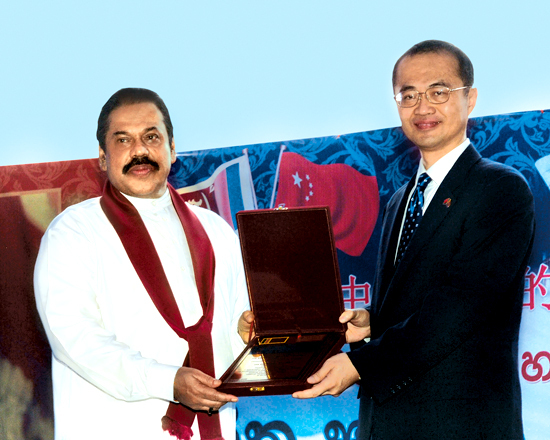 Here President Mahinda Rajapaksa presents a memento to Chinese Ambassador Ye Dabo to mark the occasion. Sri Lanka can look forward to US military assistance to crack down on LTTE terrorism as the United States is now considering to lift the arms embargo following the recent release of child soldiers by the TMVP. The Sri Lanka Sustainable Energy Authority under the Ministry of Power and Energy has implemented a program to increase energy efficiency and energy conservation to meet the energy crisis. The World Bank will provide US$ 10 million in July to reconstruct and renovate school buildings damaged in the Eastern Province. 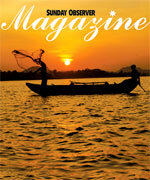 The Sri Lanka Tourism Authority will develop tourism in the Eastern province. Chairman, Sri Lanka Tourism Authority Renton de Alwis told a media briefing last week at Beruwela that tourism in the Eastern province will be developed following its liberation. The first consignment of 100,000 biodegradable and compostable bags, manufactured by a local industrialist, Plastic Pakaging (Pvt) Ltd will be exported to the United Kingdom on May 27. Talking point: GSP cat out of the bag!